Amanda Doyle (left) and Steve Pick (right) wrote "St. Louis Sound: An Illustrated Timeline," which tells the rich history of music out of St. Louis. In a separate radio feature, St. Louis Public Radio's Jeremy D. Goodwin speaks with authors Amanda E. Doyle and Steve Pick about "St. Louis Sound," as they sample music by key figures Chuck Berry, Miles Davis, Uncle Tupelo and Nelly. The coffee table-sized volume also goes beyond the men and women who made and wrote the music; it includes the disc jockeys who promoted it, the record stores that sold it and the venues where musicians performed in. On Thursday’s St. Louis on the Air, host Don Marsh talked with the co-authors of the book, Steve Pick and Amanda Doyle. After much research, the duo completed the project with a total of 177 entries to include in the book. “We could’ve easily doubled it or tripled it, because every day people are saying, ‘Is this [so and so] group in the book?’ And it turns out no, they’re not, but maybe volume two? Who knows,” Pick said. The book begins with acknowledging the history and influence of the region’s natives, from their civilization to their ceremonial use of music. “We thought it was important to talk about how the place that we live in became a place. And really the culture that was at Cahokia was kind of the first version of our metropolis now: It was a huge thriving city [that] had a lot of little suburbs — they happened to be mounds — somewhat similar to our situation today,” Doyle explained. The book goes on to share unusual stories of the various European settlers — such as French and German — who established communities in the region. “When we get way back into the history, we talk in the book about the community bands that were really important to the different immigrant communities in St. Louis,” Doyle added. 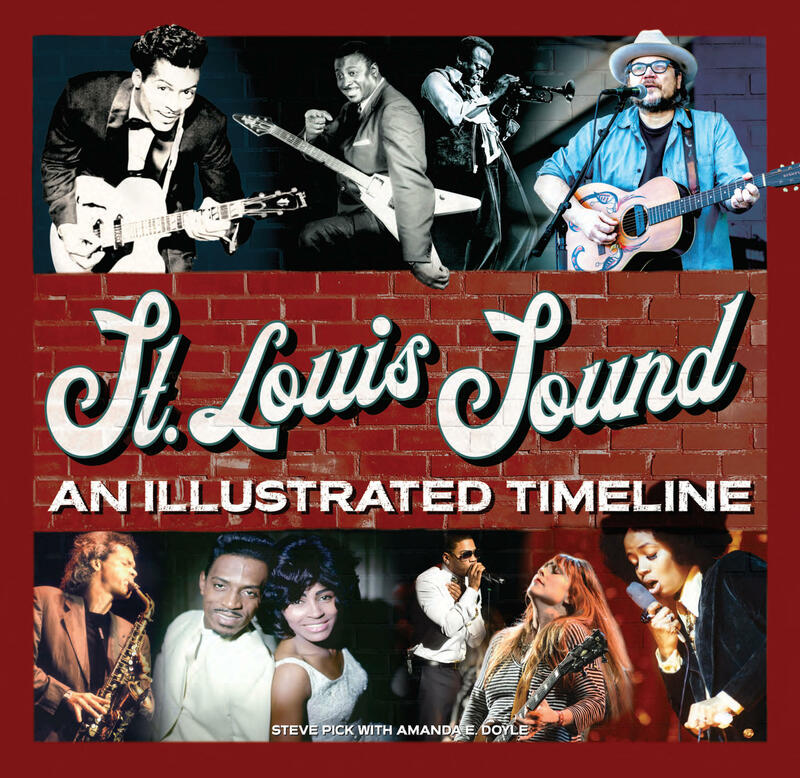 Cover of "St. Louis Sound: An Illustrated Timeline" book. There are many influential musicians that have made their mark nationwide: Frankie Trumbauer, Miles Davis, Chuck Berry and Nelly, for instance “it never stops. There’s always somebody from here going someplace,” Pick said. In addition to the book, the authors have organized a five-day music festival starting Saturday. Subterranean Books will host the book’s launch party, where Pick and Doyle will hold a book signing and share video clips of various musical performances. What: Steve Pick & Amanda Doyle Reading & Signing for "St Louis Sound"